South Africa is truly a “world in one country”. The fabric of this nation is woven with many different colors and textures that never fail to titillate the senses. The modern transport infrastructure beckons the guest to explore each nook and cranny of the area … at leisure, from the comfort of a personal rental car. A soft landing in Cape Town, the ‘most beautiful harbor in the world’. Explore her Cape of Good Hope, the brightly painted Malay Quarters and vibrant townships that crowd up against the Atlantic shoreline. Drive through the breathtaking Winelands; savor local wines and explore the quaint shops of Stellenbosch. At nearby Hermanus, the Southern Right Whales breach and frolic merely an arms’ length from land. Turning eastward, enter the magnificent Garden Route, a swatch of oceanfront beauty lapped by the warm waves of the Indian Ocean. Knysna is the destination of choice, a natural wonderland that touches the senses and restores the spirit. After a restful night in Johannesburg, it is time to go on safari! Kruger National Park – South Africa’s finest wildlife refuge – is home to all the Big Five. Venture forth on daily game drives, in open safari vehicles, escorted by passionate and professional game rangers. For those who prefer to ‘leave the driving to us’, this itinerary can be operated with a private car and driver/guide. 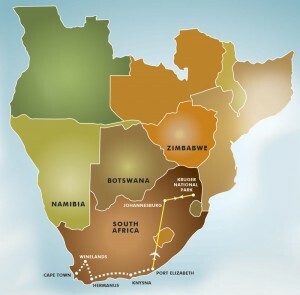 If you have a little more time, consider an extension to Namibia or fly north to Victoria Falls. Admire quaint fishing villages and espy penguins and seals enroute to the glorious Cape of Good Hope. Hop on the Robben Island ferry and tour the prison that incarcerated Nelson Mandela. Sip fine wines, explore vineyards and admire Cape Dutch architecture in this exquisitely beautiful rural paradise. Perhaps the best whale watching in the world! Explore the village and watch breaching whales and dolphins. Relax on the beach, hike through lush forest or skim over emerald green lagoons in this glamorous heart of the Garden Route. Kruger, by air, and thrilling safari days ahead. Wildlife abounds including lion, leopard, elephant, rhino, buffalo, giraffe, hippo and rhino. Daily game drives, walking safaris and superb cuisine. The indescribable beauty of Cape Town still lingers in our memories. As does the moving and emotional time we spent at the Apartheid Museum and Mandela’s infamous Robben Island Prison. South Africa is a land of remarkable contrasts and is capable of enchanting all her visitors. We feel under the spell, and can’t wait to return!